Awoke to yet another breezy morning, but it is cool! 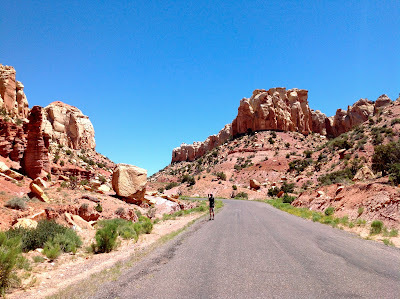 We were heading back to Highway 12 and Capitol Reef by 8:30. 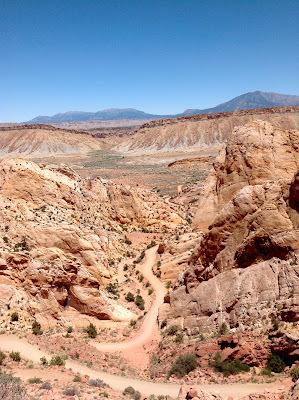 As we drive north on Highway 12 we pass through a small portion of Escalante Grand Staircase National Monument. It is the top most step in three staircases. Driving along the Escalante River. When we arrived at the town of Bolder, Utah, after finding ice, we went to the Inter-agency Visitor Center and asked what we could see in a few hours. We were directed to a number of dirt roads. 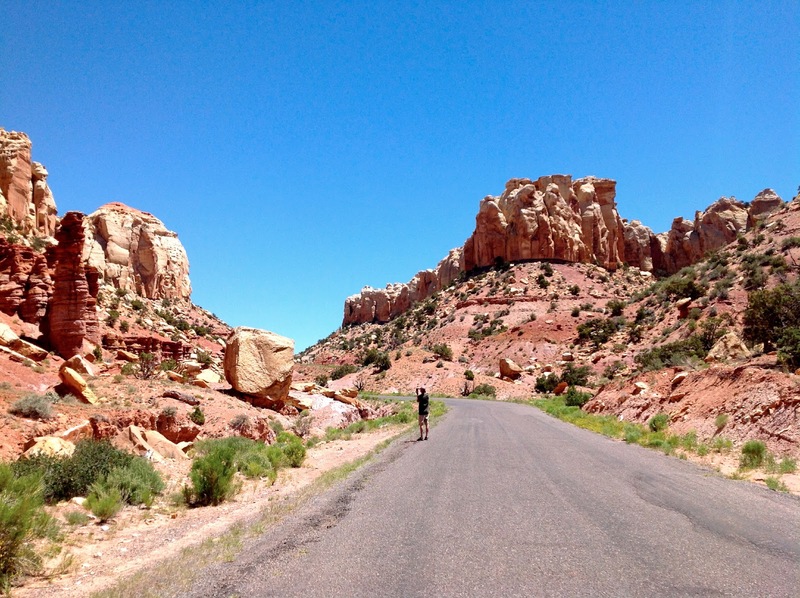 We decided to do a portion of the Burr Trail, which in its entirety takes you to the road that leads to the Colorado River (Don't they all?). 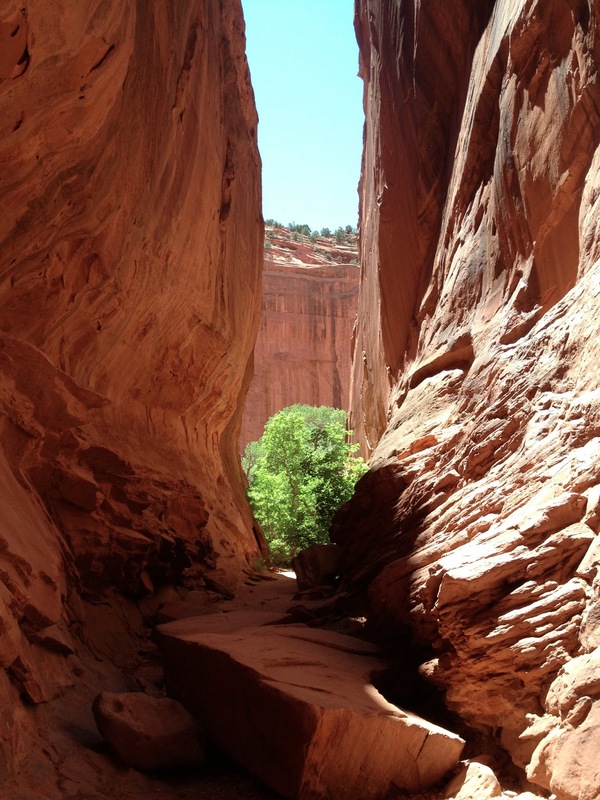 Mark and I found this slot canyon from the description the Ranger gave us at the visitor center. Good thing I hadn't read that rattlesnakes like to hang out in the before Mark and I hung out this nice cool on for about an half an hour! 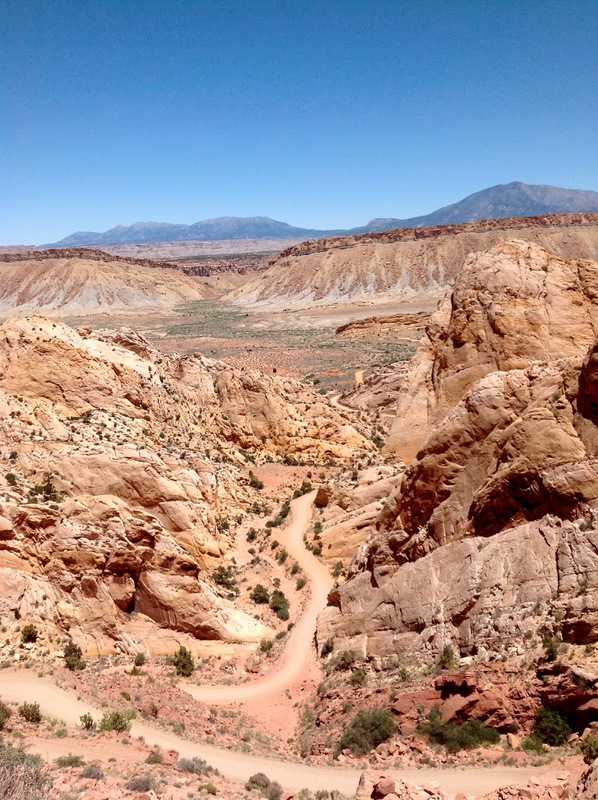 This is where we decided to turn around, looking at Capitol Reef and driving down, down, down! 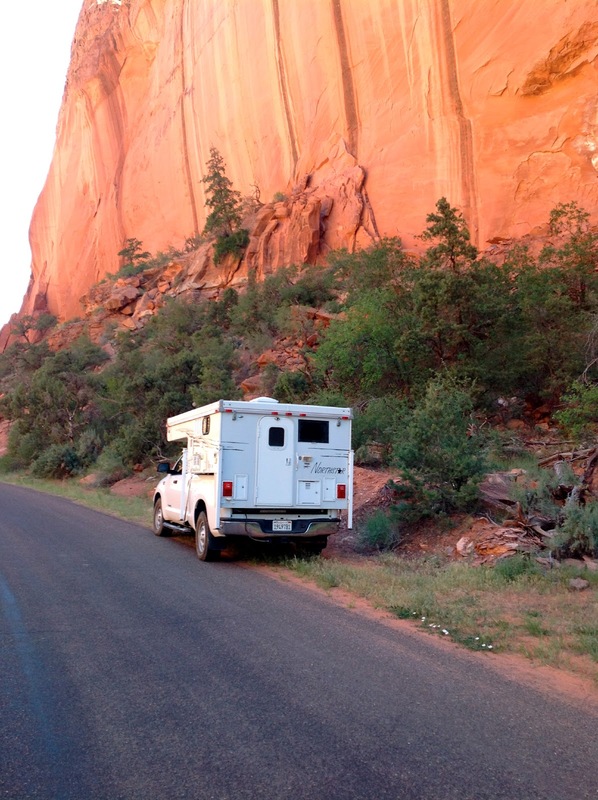 After a diverse drive through rocks covered by Utah Juniper then miles of Aspen forests we arrived at Capitol Reef National Monument to find the campground full. We drove into the visitor center anyway, just in case there were sites, even though the sign said no. We arrived just before the visitor center was to close and the answer was no sites. 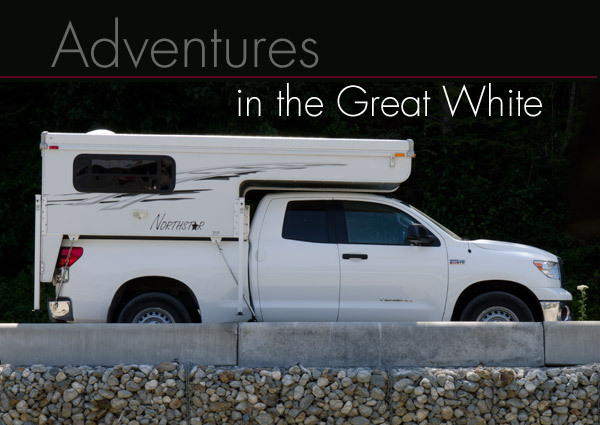 The ranger directed us back to Torrey where there were a few RV Parks. We checked into 1,000 Lakes because it was off the main highway and looked out at a large red mesa. It turned out to be a great place to stay: dinner was available, swimming pool was welcoming, showers were clean, warm and free, and laundry was close to our campsite. I hadn't used a coin laundry since last summer so 1.75 for wash and 1.75 for dry seemed reasonable. We heard the music playing from the outside patio where dinner was served, but passed and cooked our own. We did purchase some yummy home baked bread to accompany our dinner. Muffins were available in the morning, but not until 8, so we didn't put in an order. The owner says she does all this to cater to the Europeans who arrive in the large RV's and don't want to drive to find food. When we were registering a German Couple came in who had visited a few years ago, they brought back the paper with the site they had before and wanted again. Turns our the campground at the National Park was down in a hole and probably would have been hotter than where we stayed.